March is Women’s History Month, and International Women’s Day, March 8, is also a part of the celebration each year. For educators and students, the month provides a wonderful opportunity to explore and dig deeper into women’s contributions, struggles, and triumphs throughout history. A great place to start is the National Women’s History project, where students can explore this year’s theme, “Nevertheless, She Persisted: Honoring Women Who Fight All Forms of Discrimination Against Women.” Teachers will find some great resources for incorporating women’s history into lessons this month and beyond, as well as for exploring gender roles and stereotypes with students. TeachingHistory.org’s Women’s History Resources: This is a one-stop shop for diving deep into Women’s History Month. Educators will find learning resources, lesson plans, and a long list of quizzes and printables for the classroom. Online Exhibits From the National Women’s History Museum: Let students explore women’s history with these hands-on digital exhibits and accompanying lesson plans. Plus, the NWHM has produced a number of other valuable resources, including biographies, videos, and interactives. EDSITEment Women’s History Resources: Produced by the National Endowment for the Humanities, these resources include lesson plans and teaching resources that cover women in politics, the arts, and military and civilian service. The comprehensive plans highlight the time required and subjects covered, and they include worksheets and links to required reading and resources. Women’s History Resources for Teachers: These resources from the Library of Congress encourage teachers and students “to put primary resources to work in the classroom.” Featuring packaged lesson plans, this is a great resource. There are also wonderful audio and video resources, thorough primary source collections, and a number of photo projects. 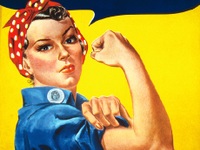 You may also want to check out the library’s official Women’s History Month page. Science NetLinks Women’s History Collection: This collection provides some interesting lesson plans that look at women in STEM fields. The page features science lesson plans and teaching resources for all students of all ages. Plus, teachers can filter results by grade level, and there is also a great list of science-specific outside links to lesson plans. ReadWriteThink’s Women’s History: Educators will find thoughtful lesson plans, a list of links to online women’s history resources, and after-school ideas for teaching women’s history for parents. There are teacher-written lesson plans available for grades 3–12. There are many great women’s history reads and resources online. These reading lists and additional resource collections may help spark curiosity in your classrooms.